Assoc. 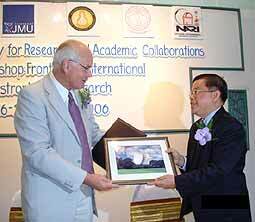 Prof. Boonraksar Soonthornthum, Dean of the Faculty of Science, Chiang Mai University presenting a souvenir to Prof. Andrew Lyne, Director of Jodrell Bank Observatory at the MOU signing ceremony. The Ministry of Science and Technology Thailand and Jodrell Bank Observatory, The University of Man-chester, United Kingdom signed a Memorandum of Understanding (MOU) on January 16 at Amari Rincome Hotel, Chiang Mai, to carry out a feasibility study of the Princess Sirindhorn Neutron Monitor project. Assoc. Prof. Boonraksar Soonthornthum, Dean of the Faculty of Science, Chiang Mai University and Prof. Andrew Lyne, Director of Jodrell Bank Observatory, co-signed the document. Thailand is located on the Earth’s magnetic equator and if the Neutron Monitor station is built in the higher areas in Thailand it could test for high energy cosmic rays, an area of research never before possible, with the most appropriate place in Thailand being Doi Inthanon peak. The Neutron Monitor would both predict and give advance warning of the effects that outer space would have on the Earth’s weather. The research will also focus on the effects of solar radiation on some systems of telecommunication. Children market with junior sales people. On January 14th, children from almost 70 children’s homes in Chiang Mai province enjoyed a wonderful day out at the 7th Nursery Day party, organized by the Children’s Home Club of Chiang Mai. There were many creative activities provided on that day offering children the chance to show their abilities on stage. There were also game zones with many prizes to be won, as well as a market with the children themselves acting as sales people. It was an opportunity for them to practice an activity that would stand them in good stead in the future and their activities impressed the audience very much. The objectives of this get together were for the children from nursing homes to meet other children and for them to enjoy a great day out on Children’s Day. Dr. George Beers, Dean of Foothill and De Anza Community Colleges in the U.S.A., presenting USD 1,000 scholarship to a third year high school student at the Prince Royal’s College. further education entitled “The Way Forward” at the Prince Royal’s Col-lege. This was a part of an English course for the students, which aims to get them prepared for continued education in a new environment in future. It was presided over by Dr. George Beers, Dean of Foothill and De Anza Community Colleges in the U.S.A. who also instructed the students on how to decide on interesting subjects when they study for their majority and how to apply for a scholar ship. Thailand-US Education Foundation (Fulbright) is an organization supporting education for youths who wish to continue study in U.S.A., and by doing so, strengthen the relationship between the two countries. Besides the education guidance, Dr. George Beers presented scholarships worth USD 1,000 US to students having good study results. Nadia Fiat and Nassee Jajang - award winning writers at PTIS. Recently, two PTIS students, Nadia Fiat (Grade 7) and Nassee Jajang (Grade 9) both received high honors for their writing. Nadia was awarded first place for an essay contest about tsunami remembrance, arranged by the Bangkok Post, while Nassee’s essay about her life and holiday celebrations at her hill tribe home was published in the magazine Student Weekly. Nadia wrote a short essay regarding lessons learned on the tsunami. She wrote “The Light in the Darkness” about how humans felt physically and mentally after the tragedy. “People can leave the negative thoughts behind and think of the positive.” She also discussed how systems can be put in place (i.e. buoys) or how signs can be learned from animals living in the sea. 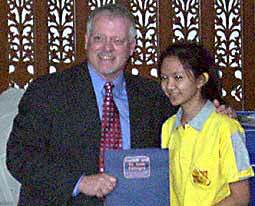 Nadia received a certificate, 5000 baht, and was invited to receive the award from Prime Minister Thaksin in Phuket. Sasima Phuengros, Managing Director of T.A. Agency (2nd from right) together with Thang Saksit Thangthong (2nd from left) and Num Kongkrapan Sangsuriya (left) presented 200,000 baht donation to Dr. Phichit Suwannakorn Vice President the Thai Red Cross Society (right), the representative of HRH Princess Patchara Kittiyapa. A concert was held to raise funds in support of the Thai Red Cross Society, whose Patron is HRH Princess Patchara Kittiyapa, on January 14, 2006 at Kad Theater, Kad Suan Kaew Department Store. The society helped flood victims in three ways. 1, by arranging drinking water, 2, distributing fresh food and 3, by providing temporary shelters, also giving help to the disabled, senior citizens, the chronically ill, pregnant women, and small children. ble budget, so the sum of 200,000 baht raised from the concert, will go a long way towards helping the victims of flooding, of which, the country has had more than usual this year. Following the success of last year’s concert, Four Seasons Resort Chiang Mai is pleased to host an evening for music lovers on Saturday, February 18, 2006, in aid of Viengping Children’s Home in Chiang Mai. ML Usni Pramoj, Privy Councilor and accomplished musician has donated his time to support this important charity. That night he will be playing the viola accompanied by K. Tasana Nagavajara (violin), K. Kitti-khun Sodprasert (cello), K. Siripong Tiptan (violin) and K. Omporn Kowintha (violin) to perform classical pieces from Mozart in honor of the 250th anniversary of Mozart’s birth. long concert in the Resort’s Intanin Room. Suggested minimum donation is 600 baht per person. 100 percent of the proceeds will go directly to the Viengping Children’s Home. In addition, ticket holders will be eligible to enter a lucky draw for weekend stays, Spa treatments, and Cooking School classes at Four Seasons Resort Chiang Mai. The Resort is offering a unique, al fresco BBQ dinner at the Cooking School at a special supplement of 1,300 baht inclusive of applicable taxes and service charge for all concert ticket holders. Tribal students visited Faculty of Economics building in Chiang Mai University. 22 tribal students and their guardians from Mae Hong Son were invited to visit Chiang Mai as part of the Unseen OTOP project, after the initiative by Dr.Songsak Sriboonjit of CMU. 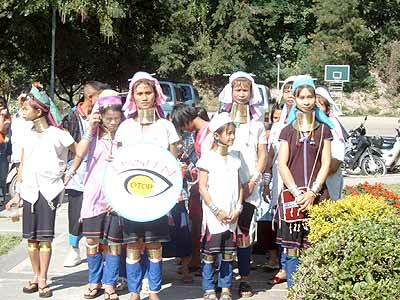 Because Hilltribe people, especially Long Neck Karen, find it difficult to travel and visit other places in the world, the objective of this project was to let tribal people visit the city and join Children’s Day activities that were arranged in Chiang Mai. The young people who visited Chiang Mai were elementary school students from Long Neck Karen, Karen, Lisu, Tai tribe, Hmong, and Lahu hill tribes. The students visited Chiang Mai Museum, CMU Demonstration School, Chiang Mai University, Bank of Thailand Northern office, and Chiang Mai Zoo and on January 14, they joined in the traditional Children’s Day festivities at Kad Suan Kaew. Unseen OTOP was organized jointly between the Faculty of Economics, Chiang Mai University and Chiang Mai Rajabhat University.